Amy L. Burkert is Vice Provost for Education at Carnegie Mellon University. She is responsible for university-wide education initiatives at both the undergraduate and graduate levels. Dr. Burkert is a biologist, whose research focused on the molecular etiology of disease. As a postdoctoral fellow, she directed a multinational research project on occupational asthma that involved time as a visiting researcher at the Karolinska Institute in Sweden. This opportunity gave her direct experience with the power of collaborative science that crosses borders, disciplines, and bridges university research with companies and communities. Since then, her rich understanding of the broad context of the practice of science today has been reflected in her work at CMU as researcher, teacher, mentor, and faculty colleague. Dr. Burkert has long been recognized as an innovator in higher education. Before becoming Vice Provost in 2010, she had been Assistant Dean for the Health Professions Program at the Mellon College of Science, where she was credited with strengthening and advancing the pre-medical education programs across the university. Dr. Burkert is also Teaching Professor in the Department of Biological Sciences, where she won awards for her teaching and mentoring of students. She has been active in a wide variety of projects that focus on the undergraduate learning experience. This includes her work on the Shared Futures project funded by the Association of American Colleges and Universities to expand global education, a project that won national recognition when CMU received a Senator Paul Simon Award for international education in 2011. She played a major part in creating new opportunities for CMU undergraduates to conduct their own research projects through her work on a summer research project funded by the Howard Hughes Medical Institution and through the NSF-funded Research Experiences for Students program. She collaborated in the creation of an introductory Biological Sciences course for CMU’s Open Learning Initiative, which is regarded as among the effective technology-enhanced learning options currently available. Dr. Burkert has spearheaded the development of new pathways for students to grow intellectually and personally, especially during their undergraduate years. She helped to create new interdisciplinary options (the Bachelor of Science and Arts degree and the Science and Humanities Scholars Program); the unified major in biological sciences and psychology; the biomedical engineering minor for non-engineering students; and the minor in health care policy and management. Student advising has always been a special focus for Dr. Burkert. She has participated in the CMU-wide Advising Task Force that has done much to professionalize the role of advisors on campus. She co-chaired a faculty committee on the Second Year Experience and partnered with faculty and staff in the development of the Big Questions project for first-year students. She has been active in outreach and expanding diversity, participating as an instructor and advisor in the Pennsylvania Governor’s School for Science and the Summer Academy of Math and Science. Dr. Burkert currently serves as President and Chair of the Board of the National Undergraduate Vice Provost organization of the Reinvention Collaborative. Dr. Burkert pioneered new courses in biological sciences, and collaborated with MCS colleagues to create EUREKA, a first-year seminar for MCS students that combines the disciplines of biological sciences, physics, chemistry, and mathematical sciences, and has championed the use of reflective writing for science students. Dr. Burkert received her B.A. from Washington and Jefferson College and her Ph.D. from Carnegie Mellon. Paul Dosal is the Vice President for Student Affairs & Student Success at the University of South Florida. In that position, he is responsible for coordinating the university-wide student success initiative, a strategic campaign to raise retention and graduation rates, boost student satisfaction, minimize financial indebtedness, and prepare all students for success in their careers or graduate and professional schools. Thanks to a collaborative "movement" involving all colleges and units, the university has made remarkable gains in undergraduate student success, raising the six-year graduation rate from 51% to nearly 70% while also eliminating the achievement gap by race, ethnicity, and socio-economic status. To advance the university's student success initiative even further, Dosal is forging a new team that touches on all aspects of the student experience, including Enrollment Planning and Management, Undergraduate Studies, Dean of Students, Housing and Residential Education, Health and Wellness, and Career Services. Dosal is also a Professor of Latin American History at the University of South Florida, specializing in the modern history of Cuba and the Caribbean region. He is the author of four books, including Comandante Che, a study of the military career of the legendary Latin American revolutionary Ernesto Che Guevara, and Doing Business with the Dictators, a history of the infamous United Fruit Company in Guatemala in the early 20th century. Born and raised in Tampa, Dosal is a fourth-generation descendant of Cuban immigrants who settled in Ybor City in 1889. He earned his B.A. in International Politics at St. Andrews College in Laurinburg, North Carolina. He received his M.A. in Latin American Studies and Ph.D. in History at Tulane University in New Orleans. Prior to joining the faculty at the University of South Florida, he taught for nine years at the University of Massachusetts at Amherst. John M. Fischer serves as interim senior vice president of academic affairs and provost at Bowling Green State University. A longtime educational leader, Dr. Fischer’s broad array of experience locally, nationally and internationally makes him well suited to understand and address the needs of faculty, the academic goals of students, and the wide range of academic affairs. Prior to assuming the provost role, Dr. Fischer served as vice provost for academic affairs where he led the finalization and implementation of the revised General Education Program-BG Perspective. He was vital to centralizing and expanding the BG Experience programs in the newly renovated University Hall. He led and collaborated on the development and revision of retention, strengthening initiatives such as the use of predictive analytics, disaggregated analysis and outreach to subpopulations, the revision of the early alert system, and other programs designed to increase student engagement and success. He helped to develop and implement BGSU’s successful eCampus, and assisted in the development and implementation of BGSU’s work with College Credit Plus. Dr. Fischer also led the effort to develop BGSU’s first winter session.Finally, he helped to implement the use of Active Learning Classrooms on the Bowling Green campus as part of the master plan and efforts to rebuild collaboration and learning spaces. Prior to his role as vice provost for academic affairs, he spent 14 years as a professor in the School of Teaching and Learning with the College of Education and Human Development and three years as associate dean for administration in that college. There his work focused on middle childhood education, growing international opportunities for EDHD students, and development of new learning spaces and classrooms in the college. As associate dean and summer dean of the college, Dr. Fischer dealt with faculty contracting, budgeting, tenure and promotion, educational outreach and faculty development. His University and college service has included curriculum review and development, the reaccreditation process, and promotion of online programs, and study abroad. His work has encompassed both undergraduate and graduate studies issues. Early in his tenure at BGSU he assisted in the development of the Middle Childhood Education program, also the creation and leadership of the International Democratic Education Institute--including travel and work in Ukraine, Kenya, and South Africa. He led the institute’s significant work in Poland, working with educational leaders, government officials and students in both Poland and on the BGSU campus on issues related to civic education and educational leadership. In the fall of 2007, as part of his work in Poland, he was named a Fulbright Scholar and completed his Fulbright at Jagiellonian University in Krakow, Poland. Finally, during this time at Bowling Green, he co-led the implementation of the GEAR UP grant, a multi-million dollar federal grant that worked with urban, struggling schools in Toledo to make college a real possibility for students. He received his bachelor's degree in elementary education from BGSU. He earned a master's degree in social studies and global education and his Ph.D. in social studies teacher education from The Ohio State University. As Dean of Undergraduate Education, Amy Goodburn is the senior academic leader who represents the executive vice chancellor's office in the EVC's absence, and whose primary responsibilities are in undergraduate education. In this role, Goodburn oversees Student Enrollment Management, which is led by the assistant vice chancellor for academic services and enrollment management and includes the Office of Undergraduate Admissions, the Office of Scholarships and Financial Aid, and the University Registrar; First-Year Experience and Transition Programs, New Student Enrollment, William H. Thompson Scholars, Career Services, the university's Military and Veteran Success Center, the Office of Undergraduate Research, undergraduate education programs, the University Honors Program; and university-wide efforts related to advising and student success. In 2015, the university earned one of three national Starfish Solutions 360 awards for MyPLAN’s successful university-wide implementation. Rachel Holloway leads strategies, programs, and resources that support the undergraduate educational experience at Virginia Tech. She works closely with college deans, associate deans, and other vice provosts to coordinate strategic initiatives to advance Virginia Tech’s undergraduate education profile, including current discussion on VT-shaped learning and curricular development surrounding Destination Areas. Holloway directly oversees areas that enhance the overall undergraduate experience such as academic advising, undergraduate education programs and efforts, undergraduate academic integrity, student success programs, and student athletes. Holloway has served on the faculty at Virginia Tech since 1989. She has progressed through academic administrative and leadership roles, having served as undergraduate program coordinator, assistant department head, and head of the Department of Communication. Prior to her current position, Holloway served as associate dean for undergraduate academic affairs in the College of Liberal Arts and Human Sciences. Dr. Blanche M. Hughes is in her seventh year as the Vice President for Student Affairs at Colorado State University. In this role she works with a Division that includes 21 departments that collaborate with other units in the University community to help our students and staff be successful. She also teaches and advises in the Student Affairs in Higher Education Graduate Program. Before becoming Vice President, Dr. Hughes spent six years as the Associate Vice President for Student Affairs, 11 years as the director of Black Student Services at Colorado State, and also served as a professor of the Sociology Department at Pikes Peak Community College for two years, one of those years as chair of the department. 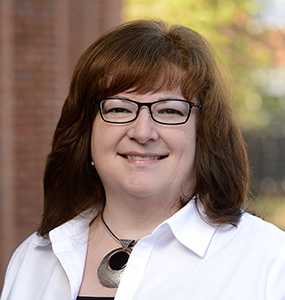 Dr. Hughes received her bachelor’s degree from Earlham College, and a master’s of education degree and doctorate degree in sociology from Colorado State University. She enjoys teaching, mentoring students and staff, presenting on issues related to diversity, parent transitions, and issues around managing work and family. Dr. Hughes is married with four children (two are alums of CSU) and three grandchildren. Elizabeth Bergmann Loizeaux, Reinvention Collaborative President, is Associate Provost for Undergraduate Affairs in the Office of the Provost and Professor of English in the College of Arts & Sciences. She provides leadership on a host of core academic efforts – from innovative curriculum development to creative uses of educational technology and honors programming – working closely with Boston University’s 17 schools and colleges to promote collaboration and strengthen the undergraduate experience. In addition to providing a central voice from the Provost’s office on matters related to undergraduate education, Beth oversees the Center for Teaching & Learning, the Undergraduate Research Opportunities Program, and the Kilachand Honors College, and pursues special projects around online education, interdisciplinary programs, and academic advising. Key to her efforts is expanding and supporting student access to all aspects of BU’s offerings across disciplines. Prior to her arrival at Boston University in 2012, Beth served as Associate Dean for Academic Affairs and Professor of English in the College of Arts and Humanities at the University of Maryland, College Park. She teaches and writes about 20th century poetry. Her most recent book, Twentieth-Century Poetry and the Visual Arts, was published by Cambridge University Press in 2008. A graduate of Mount Holyoke College, she received her MA and Ph.D. in English from the University of Michigan. Her more than 25 years of classroom experience include overseas teaching in England, Ireland and Germany. Juan J. Manfredi is an American mathematician. From 2010 to 2017 he served as vice provost for undergraduate studies at University of Pittsburgh. Prior to that, he served as an associate dean and professor of mathematics. He received his bachelor's degree from Universidad Complutense de Madrid in 1979 and his PhD from Washington University in St. Louis in 1986. His scholarly work focuses on nonlinear partial differential equations. Dr. Mike Mullen is Vice Chancellor and Dean for Academic and Student Affairs and Professor in the Department of Soil Science at North Carolina State University. As Vice Chancellor, Mullen is responsible for academic and student affairs programming across the student life cycle that contributes to the success of all students at NC State. Mullen’s current interests focus on student success in higher education and he also has interests in soil biology and biochemistry with an emphasis on microbial ecology in agricultural soils. His teaching experiences have spanned the spectrum of university students, from freshman level agricultural, environmental and academic orientation courses to doctoral level soil biochemistry courses. A native of Fort Wayne, Indiana, Dr. Mullen received his B.S. and M.S. degrees from Purdue University. He completed the Ph.D. in Soil Science from North Carolina State University in 1987. Dr. Mullen has received several teaching awards, including the University of Tennessee National Alumni Association’s Outstanding Teacher award in 1996. He also received the Early-Career Award in Education in 1996 and the Career Award in Education in 2003 from the Southern Branch of the American Society of Agronomy, and was named a Teacher Fellow by the North American Colleges and Teachers of Agriculture in 2002. Mullen is published in several journals including: Soil Science Society of America Journal, Soil Biology and Biochemistry, Transactions of the ASAE, Environmental Toxicology and Chemistry, Journal of Plant Physiology, and others. His research includes the fate of nitrogen and phosphorous in soils amended with biosolids, microbial ecology in agroecosystems, the fate of hormones from dairy wastes, and activity of soil organisms in soils of organic farming systems. Mike is married to Deborah Howard Mullen and has two adult sons, John and Michael, who are forging successful careers of their own. Hugh Page, professor of theology and Africana studies, was appointed vice president and associate provost for undergraduate affairs in 2013; he is also the dean of the First Year of Studies (FYS). His major responsibilities include expanding opportunities for and participation in undergraduate scholarship and research, implementing the Undergraduate Academic Code of Honor, leading the University’s enrollment management efforts by overseeing the Office of Undergraduate Admissions and the Office of Student Financial Services, and furthering campus conversation on issues related to diversity. Page has served as the dean of FYS—the college in which all first-year Notre Dame undergraduates enroll, regardless of their intended majors—since 2005. There, his faculty is composed of full-time academic advisors who meet one-on-one with the entire class throughout the year. Prior to assuming the leadership of FYS, Page was associate dean for undergraduate studies in Notre Dame’s College of Arts and Letters and director of the African and African American Studies Program. He was instrumental in the development of the latter into the Department of Africana Studies, which he then chaired. An Episcopal priest, Page holds a bachelor’s in history from Hampton University, two master’s degrees from The General Theological Seminary in New York, a doctorate in ministry from the Graduate Theological Foundation, and a master’s and doctorate in Near Eastern languages and civilizations from Harvard University. He joined the Notre Dame faculty in 1992 and, in 2001, received a Presidential Award for distinguished service to the University. Page’s scholarly interests include early Hebrew poetry, Africana biblical interpretation, esoterism in Africa and the African Diaspora, poetry as a medium for theological expression, and the use of religious traditions and sacred texts in the construction of individual and corporate identity in the Africana world. He is the author or editor of Exploring New Paradigms in Biblical and Cognate Studies, The Myth of Cosmic Rebellion: A Study of its Reflexes in Ugaritic & Biblical Literature, Exodus: A Bible Commentary for Every Day, The Africana Bible: Reading Israel’s Scriptures from Africa and the African Diaspora, and Israel’s Poetry of Resistance: Africana Perspectives on Early Hebrew Verse. Dr. Colin Potts, Reinvention Collaborative President Elect and the vice provost for undergraduate education at the Georgia Institute of Technology, oversees offices and programs affecting undergraduate education including the Center for Career Discovery and Development (C2D2), the Honors Program (HP), the Center for Academic Enrichment (CAE), Center for Academic Success (CAS), and the Center for Serve-Learn-Sustain (SLS). Constance Relihan, Ph.D., has been named dean for the University College at Virginia Commonwealth University, effective July 9, 2018. Relihan comes to VCU from Auburn University, where she currently serves as associate provost for undergraduate studies and director of University College. She has been on the Auburn faculty since 1990 and holds the rank of professor in the Department of English. Relihan has held her current position since 2011 and is responsible for a variety of programs focused on undergraduate student success including The Honors College, University College, undergraduate research, first-year experience activities and programs, the Auburn Connects! common book program, academic counseling and advising, and cooperative education. In addition to advocating for and securing internal funding to support student and faculty success in these areas, she worked with the Alabama Prison Arts + Education Project to gain approval from the U.S. Department of Education to participate in the Second Chance Pell program. Auburn was one of 67 universities selected to participate in the program, which permits inmates to use Pell funds to take courses and earn a degree in interdisciplinary studies. Relihan previously served Auburn as interim director of The Honors College, senior associate dean for academic affairs in the College of Liberal Arts, and assistant head of the Department of English. Relihan holds a bachelor’s degree in English from the University of Illinois at Urbana-Champaign and received both an M.A. and Ph.D. from the University of Minnesota. Carolyn Thomas is Professor of American Studies and Vice Provost and Dean for Undergraduate Education at the University of California, Davis. She works across our colleges and divisions and directly with students to achieve Undergraduate Education’s vision: that UC Davis have the strongest learning environment of any research university in the nation. She has previously served as program chair, director of the UC Davis Humanities Institute, and convener of a UC system-wide humanities consortium. As a faculty member, Carolyn’s research has explored how technological innovation and food production, combined with marketing and advertising, impact Americans’ definitions of “health.” She has been featured on NPR and the BBC for her award-winning book, Empty Pleasures: The Story of Artificial Sweeteners from Saccharin to Splenda (2010). She has written two books, two edited volumes, and roughly twenty articles on such topics as the origins of weight training, the mechanization of tomatoes in California, the fondness for Krispy Kreme donuts in the South, and the ineffectiveness of “diet” foods as weight-loss tools. Carolyn is the recipient of the Chancellor’s Award for Distinguished Undergraduate Mentoring at UC Davis, and her current research and administrative work focuses on enhancing student academic success through teaching and advising. Dr. Steven P. Dandaneau is Executive Director of the Reinvention Collaborative and Associate Provost at Colorado State University. In these roles, Dr. Dandaneau provides executive leadership for a national consortium of leading research universities focused on innovation in undergraduate education and collaborates with colleagues to strengthen the undergraduate experience at CSU.